With icy conditions impacting both teams’ rosters, the Jokers of Doom escaped with a 3-2 to win and lead the division at 3-0. Despite Chaos (1-2) having a position player (captain Adam Caron) suit up as a first-time goalie to start the game, the Jokers offense struggled. Nine shots in the first period yielded no goals. The Chaos defense stood strong, blocking shots and limiting second chances. Early in the second period, defenseman Rich Orsini won a battle to keep the ball in the offensive zone that Kenny Herren scooped up and pushed toward the net. Center Frank Melillo was waiting for the pass and found an opening to give the Jokers a 1-0 lead. Chaos would substitute a new, more experienced netminder into the game and quickly tie the score later in the period. The Jokers would continue to apply pressure though. Orsini again held the zone, and this time it was Melillo assisting on Herren’s division-leading fourth goal of the season to put the Jokers back in front. Late in the third period, Kevin LaPrade fired a wrister passed the goalie to put the Jokers ahead by two. Chaos though, wouldn’t go quietly and pulled their goalie in favor of an extra attacker with 91 seconds to play. Players from both teams clogged the front of the net. Chaos defenseman Doug Stewart floated a shot high over the traffic which somehow found its way behind goalie Andy Pettola with only 15 seconds on the clock. The comeback would fall just short though as LaPrade won the ensuing faceoff and the Jokers defense killed the final seconds. The Jokers of Doom boosted their young season record to 2-0 with a hard fought 3-2 win over the Hurricanes. The first period ended in a 1-1 tie. After the Hurricanes went ahead 1-0, Paul Bellantuono tied the game with his first goal of the season on a poke in through the 5 hole on a pass thrown toward the middle of the circles. Later in the first, Garrett Salkins picked up a short handed goal after picking off an errant goalie pass and stuffing it in the net to give the Jokers a 2-1 lead. The Hurricanes tied it in the second period and in the third Rich Orsini made a nice keep at the blue line and the ball found Kevin LaPrade to the right of the goalie between the circles and he turned and fired it home to make it 3-2. Backup net-minder Matt Dutily made several key saves including a big stop on a partial breakaway in the 3rd to preserve the victory. Notes: Dutily got the win (1-0) with 21 saves… Center Josh Berrelli returned after a 1 game absence due to undisclosed “violation of team rules”… Jim Salkins, Mike Bradigo, Bellantuono, and Orsini all anchored the back line with solid defensive play… next game vs Chaos on 12/22. The Jokers entered the Winter season with a revamped roster after having difficulties and forfeiting the entire season after only 3 games. New additions included defenseman Jim Salkins, his son Garrett (forward), defenseman John Condit, and goalie Andy Pettola. The game didn’t start off well against Hockey Balboa as Dave Shupenis blasted in a long slap shot to open the scoring in the first period. New addition Condit tied the score with his own slap shot from the point. The Balboans would add another goal off of a Jokers giveaway as the first period would end in a 2-1 deficit. After a lone goal in the second period by Ken Herren, he would stay hot in the 3rd by firing a wrist shot over the blocker on a feed from Garrett Salkins after a 2 on 1 breakout. Herren would complete the natural hat trick with a long blast that changed direction and found the corner of the net for a 4-2 lead that held until the final seconds where the Balboans would get one more goal on a point shot for a 4-3 final. Overall – a solid victory to start the season. Notes: The younger Salkins netted two assists and father Jim was very solid on the back line… Goalie Andy Pettola assisted on Herren’s 2nd goal… The Jokers were out-shot 23-19 and were 0-2 on the power play… Josh Berrelli missed the contest for undisclosed reasons. The Jokers of Doom welcomed back C/W Brian Watrous and also added new defensemen Paul Bellatuano but it was not enough to overcome the Tomahawks in a tough 3-2 loss. Ken Herren opened the scoring 3 minutes into the first period scooping up an errant clearing pass and rifling a quick shot over the goalies glove hand. The first period would end 1-0. In the second period it was a different story as the Tomahawks would outscore the Jokers 3-0 and take that lead into the 3rd period. In the 3rd, the Jokers couldn’t muster much until defensemen Mike Bradigo blasted in a power play goal from the point at 8:04. In the last 2 minutes the Jokers did have some pressure but were unable to claim the tying goal and thus the game ended 3-2. Matt Dutily stopped 33 of 36 shots in net for the Jokers. Next up is a Saturday matinee at 1:00pm vs Springfield Chiefs (1-1). Delfo Tringali suffered a groin injury in the 1st period and returned in a limited role. No word on the severity or his availability for the next game. The new season brought a few new faces to the Jokers of Doom roster, including goalie Matt Dutily, forwards C.J. Lupoli and Delfo Tringali, and defenseman Aaron Duncan. Unfortunately the overall results continued to resemble last season with a major struggle to put the ball in the net. Miraculously the Jokers and opponent Charlestown Chiefs both had 31 shots on goal, but almost all the quality chances were with the Chiefs, including a hat trick from Sean Miller. The Jokers could just never break through the stout Chiefs defense, with most of the shots coming from lengthy distances or tough angles. Dutily’s first game as net minder came with many point blank shots, so the Jokers will look to tighten the defense and generate some offense in the next game vs the YellowJackets. The Jokers of Doom took a somewhat short handed squad into Friday night’s tilt with Charleston Chiefs with 3 available subs. Through 2 periods the Jokers held their own and findings themselves down 1-0 entering the 3rd period. In the 3rd, the Chiefs would add two more goals to go up 3-0 before the Jokers fought back with goals from Kevin LaPrade and Devon Sylvester to pull within 3-2. Alas, the Chiefs would grab a 4th goal and later add an empty net tally to make the final score 5-2. They will try to keep their slim playoff hopes alive on Thursday versus the 0-5 Crusaders. The Jokers of Doom had dropped their first 3 games of the season by scores of 2-1, 6-2, and 3-1. They were desperate for a win last night vs Big Fish and short on players with only a single bench player. The score was 0-0 after the first period but in the second period Mike Bradigo finally broke through with a shot from the defensive point. It was a bit of a change up but it found it’s way to pay dirt. Later in the second Chris Dickinson picked off a wayward clearing attempt and fed a nice pass down low to Kevin LaPrade who fired a quick wrist shot past the goalie. The second period would end 2-0. In the third, the tired Jokers were trying to hang on when a loose ball and scramble in front of the net produced a Big Fish goal. The score was now 2-1 and the opponent pulled the goalie and attacked the net but in the end it was not to be as Jokers goalie Fernando Gomez withstood the barrage and preserve the victory. 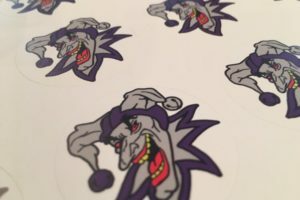 The Jokers of Doom welcomed back a couple of teammates of the past in the season opener as defenseman Pete Hughes, winger Ray Glowicki, and center Kevin LaPrade returned for the summer. It was not a happy return though, as the new-look Jokers were a bit short on players and couldn’t overcome the Vikings in a 2-1 loss. Overall the team played well including out-shooting their opponent 30-19 but couldn’t punch through a second goal after taking a 1-0 lead on a Glowicki put-back off of a rebound in the second period. Ken Herren squandered two quality chances missing high on a cross goal pass from Devon Sylvester in the 2nd and firing a breakaway shot low and just wide of the net in the 3rd. The Jokers kept the pressure on even getting a power play and a 6-4 man advantage with their net empty for the last minute but couldn’t capitalize. Notes: Fernando Gomez got the start in net and stopped 17 of 19 shots… Frank Melillo served game 1 of his 3 game suspension from last season’s playoff game melee… Jokers next take on the Tomahawks Thursday June 15 at 10:00pm. The Jokers of Doom played very well at the end of the spring 2017 season to secure a playoff spot. Unfortunately, they ended up in the 4th position and a date with top seed Springfield Chiefs. Things did not go well from the start as the team found itself down 1-0 quickly in the first and couldn’t stop the onslaught as the lead eventually grew to 6-0 before Ken Herren finally flipped in a goal mouth pass to make it 6-1. A violent scuffle in the 3rd period would result in the ejection of 2 players including veteran Frank Melillo. The game would end with a final score of 7-1. The Jokers will look to improve in the upcoming summer session which will include an 8 team division. Captain Jim Brunetti is working the phones hard to fill out the roster. It’s over. The Jokers rode a 4 game win streak into a playoff berth and had a chance to improve their standing to 3rd place in the division with a win or tie versus Charleston Chiefs. Although the momentum was there the effort was not in a lackluster 6-2 thumping. After being down 2-0 after one period there was signs of life as the deficit would only be 3-2 after two periods on goals by leading scorer Josh Berrelli and Dave Dreschler on a nifty intercept and quick shot goal. It would all fall apart in the decisive 3rd period on 3 goals by the Chiefs to close it out. Once again shots on goal were hard to come by as the Jokers could only manage 17, getting out shot overall 31-17. With the loss, the Jokers find themselves in 4th place and a very tough matchup versus the number 1 seed Springfield Chiefs on Tuesday May 30 at 8:00pm. In their single game during the season, the Springfield Chiefs won, 7-5. Notes: Fernando Gomez made 25 saves and ends the regular season with a 3-3 record and will be the starting goalie in the playoffs due to Tim Fisher not having enough games played… Jim Brunetti, Ken Herren, Rich Orsini, Jimmy Dowd, Josh Berrelli, Frank Melillo, and Devon Sylvester all confirmed to return next season… Rumors of a Kevin LaPrade return also continue to swirl, no comment from captain Jim… Top 3 scorers: Berrelli 17 points (14g, 3a), Dreschler 14 (5g, 9a), Herren 10 (6g, 4a).